Müeller’s Gibbon (Hylobates muelleri) [also known as Bornean Gibbon or Mueller’s Bornean Gibbon] is a small species of gibbon endemic to the tropical rainforests of northern and eastern Borneo. Similar to other gibbon species, Müeller’s Gibbons are highly vocal. The ‘great call’ of the female is characterized by accelerating whoops followed by a rapid series of bubbly notes. Male-female duets are an iconic sound of the Bornean rainforest at dawn. MBT1 A pair duet from the Maliau Basin, Sabah. This cut includes several examples of the distinctive bubbly female ‘great call’ of this species. T36 A long series of whoops from a female building up to a ‘great call’ at the end of this cut. Recorded in the Danum Valley, Sabah. T35 A few pairs singing at dawn in the Danum Valley, Sabah. 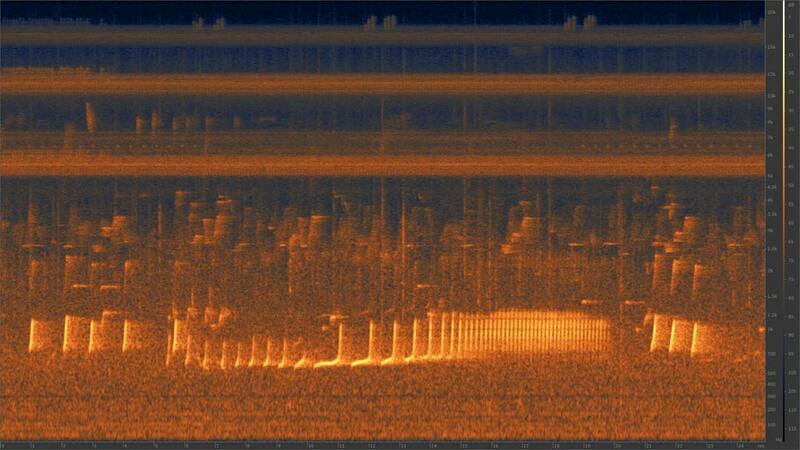 Spectrogram showing a typical female great call of the Bornean Gibbon – a series of relatively simple, accelerating upswept whoops building to a climax of bubbly staccato notes. 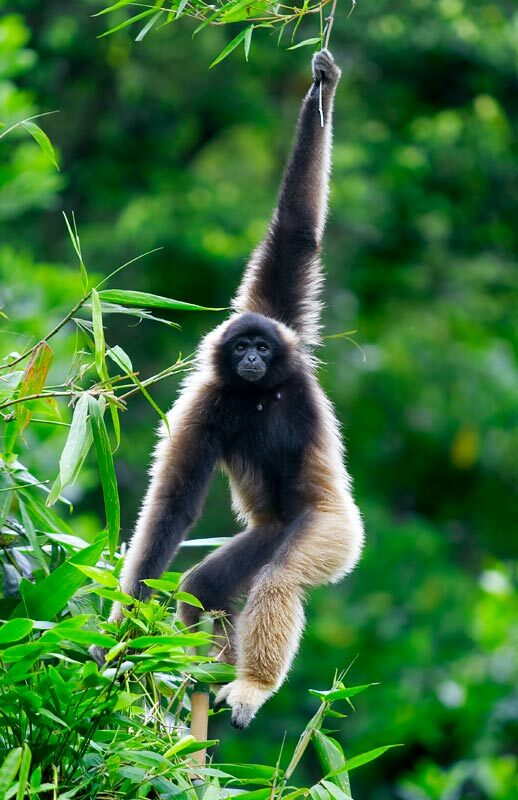 Due to the rampant destruction of Borneo’s lowland tropical rainforests, Müeller’s Gibbon has suffered significant population loss and is now considered endangered. The expansion of oil palm plantations throughout Borneo is an ongoing threat to this species as well as countless others which depend on rainforest for their survival. 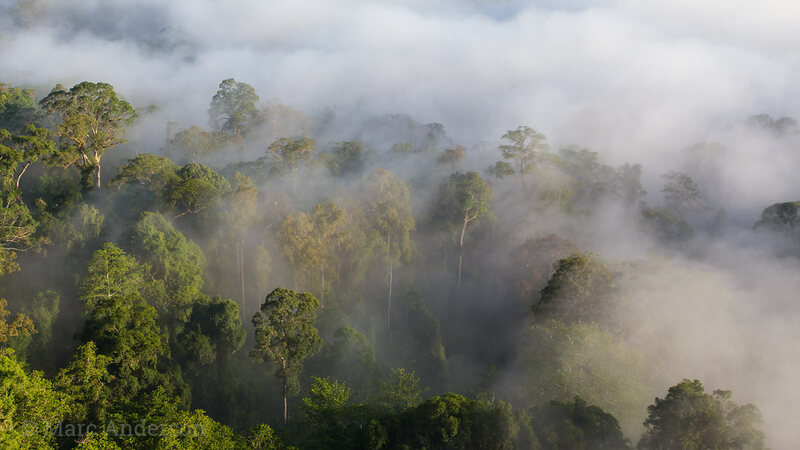 The photograph below is from the Danum Valley in northern Borneo, a stronghold for this species and an example of ideal Bornean Gibbon habitat.